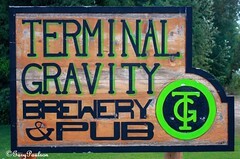 On our drive to check out Wallowa Lake, I noticed a sign saying, “Terminal Gravity Brewery – 1 block”. I was sure I had heard of it before and even if I hadn’t we would have to stop on our way back down. 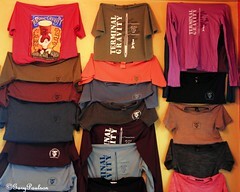 So, after cheking out the Oregon State Campground for a future adventure and taking photographs of the spawning Kokanee salmon, we returned to Enterprise, Oregon and Terminal Gravity Brewery. Although they seem to have a large facility, they must not receive too many visitors. 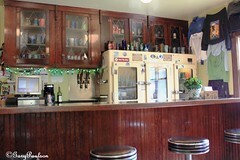 Besides a few picnic tables outside, inside they have only 4 stools at the bar and 2 tables. I ordered a pint of Breakfast Porter and Von had a cup of coffee (sometimes it is good to have a non beer drinker with you). The porter was delicious and was quite satisfying as a liquid lunch especially since we had a very late (and large) breakfast. Before leaving I asked about their Barley Wine since it is a style I am not familiar with. The waitress brought me a sample to try. On the palate the Barley Wine had quite a lot of body with a citrus-fruity taste that was balanced by the +11% alcohol content. 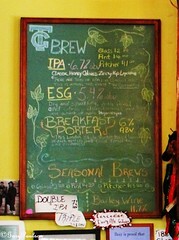 I decided to bring a growler of this home and to pick up a 6-pack of their IPA for my oldest son. Now there is one more reason to go camping next year at Wallowa Lake.